LET'S GO LADY HUSKERS!!!!! THE LADY WOLVERINES!!!!! "Senior Hallie Thome is closing in on becoming the third member of the 2,000-point club at Michigan, entering Thursday's contest with 1,976 points. Thome is third all-time at Michigan in scoring and fifth in rebounding (824). Katelynn Flaherty (2,776) and Diane Dietz (2,076) are ahead of Thome on Michigan's all-time scoring list." hoping it will have to wait! The Nebraska women’s basketball team will shoot for a season series sweep at Michigan on Thursday. • Nebraska rallied for a 70-56 win over Michigan to open Big Ten Conference play on Dec. 28. The Huskers outscored the Wolverines 33-13 in the fourth quarter after scoring just 37 points in the first three quarters. 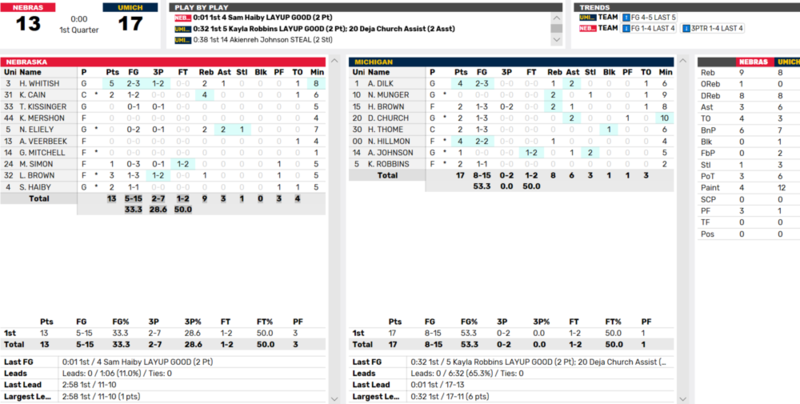 Michigan led 43-37 at the end of three quarters, before Nicea Eliely scored all of her game-high 14 points in the final period to spark the Huskers. • Nebraska has been led in conference play by the resurgence of Hannah Whitish who is averaging 15.3 points and 5.7 assists over her last six games, including 28 points and 12 assists the road win at Purdue. • Although Nebraska is 10-12 overall and 5-6 in the Big Ten, the Huskers have fought hard down to the wire, with 10 games decided by two possessions or less. • Thursday’s game features several of the Big Ten’s best freshmen, including the defending conference co-freshmen of the week in Nebraska’s Sam Haiby and Michigan’s Naz Hillmon. Haiby had her best week in Big Ten play last week by averaging 15.0 points and 2.0 assists while hitting 10-of-15 shots from the field, including 3-of-4 three-pointers, and 7-of-8 free throws. Haiby hit three shots to beat the buzzer last week, including a half-court runner to end the third period at Purdue. • Another featured freshman match-up is Nebraska’s Leigha Brown (Auburn, Ind.) and Michigan’s Amy Dilk (Carmel, Ind.). Brown, runner-up for Indiana POY to Dilk, is averaging 10.3 points in 19.2 minutes off the bench in Big Ten play. Dilk is averaging 9.1 points in 35.5 minutes per Big Ten game. • Michigan heads into the rematch with Nebraska after putting together its first back-to-back Big Ten wins; a 90-81 win over No. 13 Iowa @ home and a 76-70 win at Wisconsin. • Michigan features a good blend of experience and youth. Hallie Thome, a 6-5 senior center, is averaging 12.9 points and 6.0 rebounds per game, with 13.7 points and 6.9 boards in Big Ten play. Thome had 14 points and seven rebounds in the first meeting this season at Nebraska. • Fellow senior Nicole Munger has led the Michigan starting backcourt with 10.4 points and 3.1 rebounds per game. Munger is shooting 35.7 percent (46-129) from long range. Munger managed four points at Nebraska. • Sophomores Deja Church averages 8.8 ppg, 4.3 rpg, 2.5 apg, and Hailey Brown averages 7.5 ppg, 4.5 rpg. • Freshman guard Amy Dilk is averaging 7.5 points, 4.5 rebounds and 4.5 assists on the season increasing to 9.1 points and 5.2 assists in Big Ten play. • Freshman Naz Hillmon, a 6-2 forward, is averaging 12.7 points and a team-best 6.7 rebounds. • As a team in Big Ten play, Michigan is averaging 70.2 points per game, while allowing 72.1. 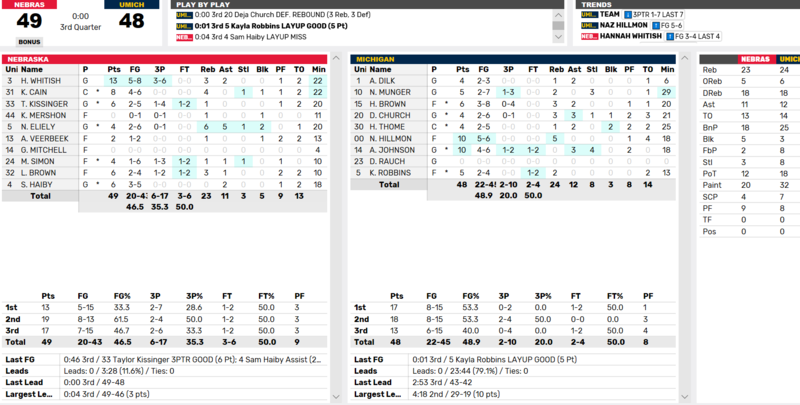 In non-conference play, the Wolverines were holding foes to just 55.8 points per game. The Wolverines own a plus-2.6 rebound margin in the league after dominating the boards (44.7-30.8) in non-conference action. 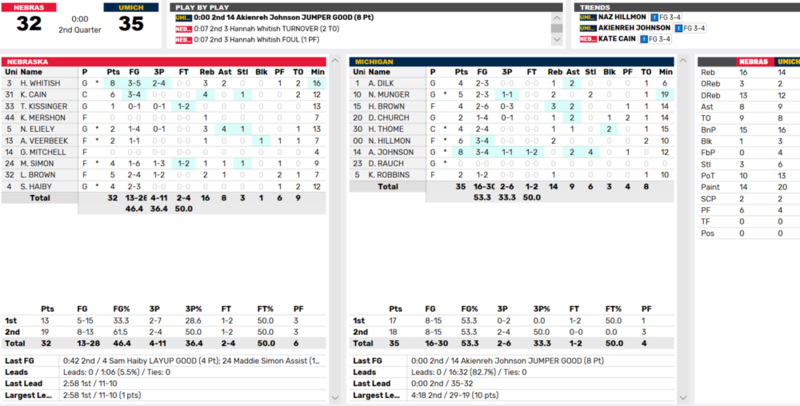 Michigan is shooting a solid 44.3 percent from the field and 32.9 percent (46-140) from three-point range in Big Ten play. Michigan has hit just 66 percent of its free throws in league play. Amy Dilk, is down, non-contact injury to knee on replay. The girl that came in, #10 - Munger? She gets away with a lot. Pulls, flops, undercuts,..... Dirty? Our offense is way to predictable...run the same way every time we play half court ball...except for Brown...and Haiby. ....Mix it up girls ! SIMON QUIT SHOOTING THE 3 BALL. Matt Coatney: "Ashtyn VeerBlock!" I Like It! That foul on Whitish is not a foul. I just replayed it in slow motion. Hannah moved left to avoid contact. They didn't even touch. Guessing at least a sprain if not a torn ACL or something. Matt: Ashtyn VeerBlock! I Like It! Apparently she doesn't need to play much..7 min in 1st half ... but Katy is having a decent game. I would love to see both play 20+ together. Pick up the defensive intensity and take care of the ball and we might get out with a W! Another Coatney-ism: "Guarding Munger like she didn't put on deoderant!" Not a great way to end the quarter. Like where we're at now.... we're fighting back. We can win it if we stop our turnovers.